surfingpelikan has no other items for sale. 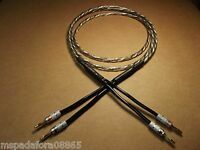 AUDIOPHILE SINGLE CENTER CHANNEL SPEAKER CABLE 12 GAUGE, BI-WIRED, 5 FT.
Don't let their size fool you. Small and compact, these Sony SS-B1000 2 way bookshelf speakers can deliver optimum sound in a perfectly sized package. At a little over 10 inches high, these Sony units can deliver 120 watts of power and can make a perfect accompaniment to any home theater system. A 5.25 inch cone woofer can offer those deep bass tones that balance with the sweet notes coming from the one inch Nano fine, balanced dome tweeter. You can place these devices on a bookshelf or desk to have them out of the way in any room, but when you pump up the volume, you can know they are there as every note beats to perfection with 80-50,000 Hz frequency response.The black Sony SS-B1000 can employ high quality features to deliver a full range of sound with very little distortion. The highly oriented polyolefin, or HOP, cone woofer can create low frequency sounds and strong bass. At the same time, the balanced dome tweeter can handle the high pitched sounds with ease. This can result in a balanced listening experience for increased enjoyment. The impedance of this model is 8 ohms and the sensitivity is 87db. A bass reflex enclosure can increase low end efficiency by improving extension and response.The expansive soundstage can offer full audio that remains accurate and sharp. 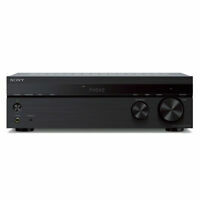 This Sony product ranks high in terms quality and volume of sound for bookshelf models. Music played through these speakers can sound crisp, clear, and full. Having two separate units means stereo separation is possible by placing a speaker on each side of the room. This pair of speakers is wired to connect to your choice of amplifier or receiver. Additional speaker wire is one of the accessories that is commonly paired with this device.At 13 inches by 18.8 inches by 9.7 inches, the compact dimensions of this product mean it can fit easily in an area that is out of the way. Lightweight at just 6 pounds, they can be a perfect fit for a bedroom or apartment. Another great place to use them is in the kitchen or dining area to enjoy music while you eat. Bookshelf speakers can be a great way to achieve quality audio in a tight space, but they can also be paired with additional speakers to create a full surround-sound system. These can function well as rears and can also be used as front mains. They can also perform well when placed on a stand. The aesthetically pleasing design is straightforward and sleek with removable speaker grilles. The sturdy construction is built to offer long term use.The Sony brand speakers can be an ideal addition to a home theater set up. They can be connected to TVs with an amplifier to produce excellent audio for movies, Blu-ray, and DVD players, and other video options. They can work well at any height and can fit into an existing entertainment center. Audio from your TV can have more depth and better overall quality when using this pair of speakers, which can supply an unmatched auditory experience. They can show how much difference quality parts and construction can make in the field of electronics. My primary reason for getting these speakers was to complete a surround system around a recently acquired set of Sony front speakers from the same series (ss-f7000 and ss-cn5000). They have proved perfect for that duty. As a standalone speaker, they are fine given the usual limitations of a speaker this size. There are lots of comparable alternatives size and cost-wise if you shop carefully. Energy, Boston, Polk, just a few possibilities if voice matching a set is not a consideration. Perfectly decent speaker for the $. I could use them in many situations and be happy. A friend of mine picked up a pair of these ss-b1000 speakers on the cheap ($15 dollars at Goodwill--lucky find). The audio they provide from TV and music is great and worth every penny of the $60 I was happy to pay for them here. They work great with Sony receiver and subs I have been stashing away until now. Bang on! The adage "You get what you pay for" usually applies to electronic, even when paired with a reputable name like Sony. I am happy to report that the sound from these speakers sounds much "richer" than what I paid for them. Sound quality is subjective, however, and usually a matter of , listener's ear, comparison, application. I would like to consider myself an audiophile on a budget (I know what sounds good, even if I know I can't afford it). With that being said, its not any of the big tag brands. The kinds of speakers that are sold in their own stores, but these speakers will hold their own against most any brand that can be found at your neighboring electronics store or department. I am using these speakers as rear fill/surround in a carpeted medium sized room. They are paired with Sony towers, center and sub. Assuming you are shopping for the right speaker (your expectation, doesn't exceed your wallet or reality) then rest assure; these speakers, more than likely, will be meet your need. These speakers put out great sound as long as you put 100 watts or better into them. 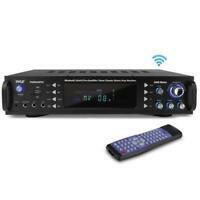 My receiver put 135 watts into them and they can handle a bit more. Never pushed them harder than 135 watts because My receiver only put out 135 watts per channel. My new receiver puts out 145 watts per channel but I got all new higher watt speakers so I never used them with my new receiver. I am confident that they would have performed well I just wanted way more power from my 4 main speakers for the music application. They were awesome in the 5.1, 7.1, and 9.2 application for movies and also worked well as surrounds side and rear. They ran very nicely as my front mains but I upgraded my receiver and amplifiers so I went up to 350 watts per channel on the 4 main speakers with 12" speakers in the enclosure used for mid range instead of sub with a separate amp. I use two 10' velodyne for my sub now. The only reason why I'm selling this system is because I upgraded everything. Small Package, Big Performance ! I bought these Speakers to use as the rear surround speakers in a 7.1 Surround Configuration. I am a long time user of Sony Audio & Video Consumer products as I believe that Sony gives Big Performance at a Great Value, and these Small Speakers do not disappoint. The size is perfect as a rear surround speaker and the sound quality is right up to par with what I expected. Also, the appearance of the speakers are of high quality and look good in any living room/media room situation. In my Opinion, these Speakers deliver Pleasing Performance, Good Quality, and Great Value.